GOP Rep. Jeff Holy seeks to be elected to the state Senate; Democrat Jessa Lewis is challenging him. In Washington's Sixth Legislative District, which covers much of south, west and north Spokane, the incumbent senator, Michael Baumgartner, is vacating his seat to run for Spokane County treasurer. 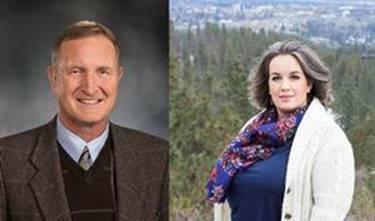 That has set up a state Senate race that features a Spokane state representative and a health care advocate. Republican Representative Jeff Holy is six years into his legislative career in the state House, just long enough, he says, to finally get the hang of things in Olympia. And just as he achieves that, he decides to give up his seat and make a run at the state Senate. “Tongue in cheek, I guess I’m sort of graduating from the junior varsity to the varsity and trying to increase my efficiency and the leverage I have in Olympia,” he joked. Holy is a former Spokane police detective, a lawyer and a self-described pragmatic politician who says he’s more interested in solving problems than in upholding ideology. He says his time in Olympia, six regular sessions and several special sessions, has helped him to understand the big picture of state government. “The big picture is trying to focus on the priorities of government and help the people of Washington state be successful in their personal lives, their business lives, their investment lives, their social lives, to make sure that the laws are fair and just and applied to everybody equally, that they don’t hurt anybody in order to avoid unintended conflicts, complications, consequences of legislation we propose and to run interference with the multitude of state agencies out there on behalf of citizens here," he said. In 2018, Holy was one of the main sponsors of a new law that eases some of the financial burdens for formerly incarcerated people. It lowers some of their court fees and eliminates the interest they pay on some of their debt. His years in the legal system helped him understand and work that bill. “The problem is the depth of knowledge we have, in any topic, outside of our areas of expertise, the skillsets that we bring, which sometimes are endless in depth from life experience and education, are about six inches depth and two miles wide. That makes us dangerous,” Holy said. Jeff Holy’s Democratic challenger is Jessa Lewis. She’s the eastern Washington director of Health Care for All, an organization devoted to increasing access to health care. Lewis advocates for a solution that’s the norm in many westernized nations. “We had a bill in each of the House and the Senate to pass a universal, single-payer trust for the state of Washington. So that would cover everyone who is not currently covered by a federal plan such as Medicare or Tri-Care. We were literally six votes short in both chambers of getting it done and I’m running to complete the job,” she said. Lewis says fixing health care is just one piece of what should be done to improve the wellbeing of children and adults in the state. Jessa Lewis and Jeff Holy are the two candidates running for an open seat in Washington’s Sixth Legislative District. Holy won about 52% of the vote in the primary. As of this week, he reported about $133,000 in campaign contributions. Jessa Lewis reported $109,000.